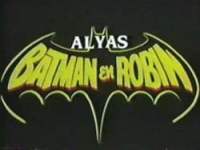 This film features Philippines' funnyman Joey De Leon taking on the role of Batman. The story is actually a parody of the popular 1960's TV show and has absolutely nothing in common with the current crop of dark Batman films, comics or animated series, except for the costumes and the names. The producers couldn't change the names of the characters to something that sounded good. They wanted a Batman parody, so how can you change a name like Batman? Even Wonder Woman makes a brief appearance at the end! Not surprisingly, the studio that made this film had some legal problems afterwards, but it looks like the studio won. (In Tagalog language, with English subtitles).